Primary rate Interface (PRI) is a service level of Integrated Services Digital Network (ISDN) which gives specifications for carrying multiple voice and data transmissions between a user and the network. 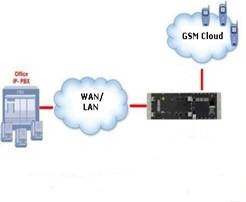 In layman terms, PRI is a standard which help provide services for business concerns and offices which are operating digital PBXs for their cellular communication needs. There are a large numbers of organizations and call centers which have immense communications needs and need to make thousands of calls over all networks such as fixed line, mobile operators etc. At this current time, organizations & companies need to have digital PABXs in which they keep Sims of different mobile operators and make calls through these SIMs. With PRI, they do not need any SIM, as their exchanges can directly be connected to the nearest cell site or MSC of the concerned service provider. This connection is usually based on fibre optic although other mediums can be used. For this purpose, the services of a local loop operator are utilized who provides this medium, at a monthly rent of course. Currently such solutions are being offered by PTCL since it has its own fibre optic backbone but cellular operators have rarely ventured into it. This could be due to licensing problems with PTA since the licenses were issued for GSM services, and according to some legal experts, cellular companies are not allowed fixed line telephony whereas others have the opinion that this is not fixed line telephony. Whatever the legal opinions, cellular companies should explore this solution. Big business/corporate customers should also look into this option to get better deals. A good topic and keeping in view my experience of the Fiber optics the only company who can deliver this rightly is Nayatel as they have fiber connection with every operator in ISB. I don’t know whether the writer knows it or not – cellular companies are using PRIs primarily for providing VAS services e.g Juke Box or Music services and Call Center lines of Mobile Operators are implemented using PRIs. Talking about your proposition of direct connectivity with MSCs of partner mobile/fixed line operators, i reckon you don’t have the idea how much it’s paid on monthly basis for one single E1 and more effective & economical solution for small offices is to use tellular devices like they might be using at the moment as opposed to having direct connectivity with exchanges of partner operator. Plus they’ll have to bear extra expenses for leased media being used for the connectivity. PRI is being used as a channel for sale and generating revenue by mobile operators from last 3 years, almost all operators have customer based on PRI providing the Call center and other business solutions. The stance of PTA is still being waited on it as PRI based solution and connectivity directly to MSC over E1’s are not covered under the liscence of mobile operators. WATEEN telecom is also offering very good solutions for PRI and SIP Trunks over Fiber and WiMAX Media. For example: DID ,DOD , Sip Trunking,UAN and Hosted PBX. Hi Yasir, we are currently looking for a solid ISDN (PRI) solution other than PTCL for a number of speech/voice technology projects that involve setting up a telephony platform to record incoming fixed line and mobile calls. Would you be able to refer us to someone at Wateen or elsewhere to discuss a possible solution?